In order to book an appointment for any permanent makeup procedure with Kim you will first be required to have a complimentary phone consultation. This consultation will give you a lot of the following information, but also allows Kim to make sure you are a good candidate for the procedure, are aware of healing time for scheduling and the protocols that need to be followed. ​We know it may seem like a lot, or even overkill, but one thing is for certain - your results from this procedure depend largely on how you follow aftercare and adhere to directions. Permanent makeup is permanent, it's not something to be done on a whim and it is a serious decision for a person to make, so we take it seriously when informing you in the most detailed way possible to ensure you get the amazing results you're wanting! You may have seen in your searches for Microblading that it's "semi-permanent." We want to take a moment to clarify this. Permanent Makeup (and yes, this includes Microblading) is PERMANENT. The term 'semi-permanent' gets used a lot because of the manner in which PMU will fade over time, but we (and the SPCP) feel that this term is a bit misleading and incorrect. Semi-Permanent implies that at some point in time the tattoo will completely vanish from the skin - and this is false. Permanent Makeup and Microblading are all forms of tattooing - and tattooing by definition is a PERMANENT procedure, in the case of PMU however, there is significantly more fading than in a traditional body art tattoo. PMU will lighten and fade over time, touch ups are generally required to keep the tattoos looking fresh and bright, for some this sounds like a huge bummer - but trust us, it's in your best interest that it fades. Because YOU change over time, it's a benefit to have PMU fade as well because then you have the option to change it as you change. PMU will fade over time, in some cases significantly, but it is unlikely that it will ever completely fade out of the skin. The reasons PMU fades as it does are due to the style of the tattoo - a full color tattoo without a black outline to 'hold' the pigment and because of the location - your face - which is always exposed to the sun. UV radiation is the #1 culprit for causing tattoos to fade, so it's obvious that this tattoo will fade even more than a traditional body art tattoo. When tattooing is performed in a safe environment with tested pigments and clean instruments it is generally a very safe procedure. In general, the biggest risk is infection after the procedure due to lack of or poor aftercare. Our salon is fully permitted and adheres to the AB 300 California State Body Art Act regulations and standards. Kim has been trained with a 100 Hour Permanent Makeup course from Daria Chuprys - Beverly Hills, has current Blood Born Pathogen Training and is a member in good standing of the Society of Permanent Cosmetics Professionals. All instruments used are sterile one time use only and are discarded after each procedure. We take every step possible to limit and eliminate infection potential. Kim uses all Li Pigments which are Cruelty Free and rigorously lab tested and have been in production for over 25 years. Tattoo pigments in the US are not 'approved' by the FDA as they are regulated as Cosmetics - in the EU pigments are tested and approved, Li Pigments are certified under these standards in the EU Resolution ReSap (2008). We use a lidocaine solution to numb the area as best as possible but every person processes lidocaine differently and at different rates - so while one person may feel no pain at all, another may have a more painful experience. To numb the area we open the skin by pricking it with the tool, this generally feels like 'intense tweezing' and takes about 2 minutes. The remainder of the procedure is performed with lidocaine and 90% of the time clients report no pain to mild discomfort. -Undergoing Chemotherapy or other significant medical treatments. -Have difficulty dealing with significant changes and are worried or unsure about doing the procedure. Please contact us if you are unsure that your individual condition applies. Do I Really Need a Touch Up? Permanent Makeup is considered a two part procedure, and a control touch up is often necessary to achieve the desired result. PMU will heal differently on every person, and much of that variation will have to do with your particular skin type and how you care for the brows while they are healing. It is rare that PMU heals perfectly in one procedure, most often clients do need their touch up. Kim includes the 6 week Control Touch Up with her initial procedure cost to make sure you get the results you desire. In some cases clients may need an additional touch up after the 6 week touch up to get optimal results - this is something that we can rarely gauge in advance - it depends on how much a client bleeds during the procedure, how they care for them after and their general skin type or previous tattoo. This additional touch up is a small fee of $50 to cover the materials cost. Allergic reactions to tattoo pigments are actually considered very rare. If you do have specific allergies please let us know in advance so that we can triple check our products to be sure to create a safe environment for you. Many clients who have allergies to cosmetics opt for permanent makeup because it removes the need for makeup! Our detailed health history will also help to ensure we create a safe environment for you. If you're still worried about allergic reaction we can also perform a patch test to gauge your immune response to the procedure. Cover ups and corrections are something the Kim has a great talent for. If you have a previous tattoo please email us a photo of your brows with no makeup on in good lighting so that we can assess what we can do for you. 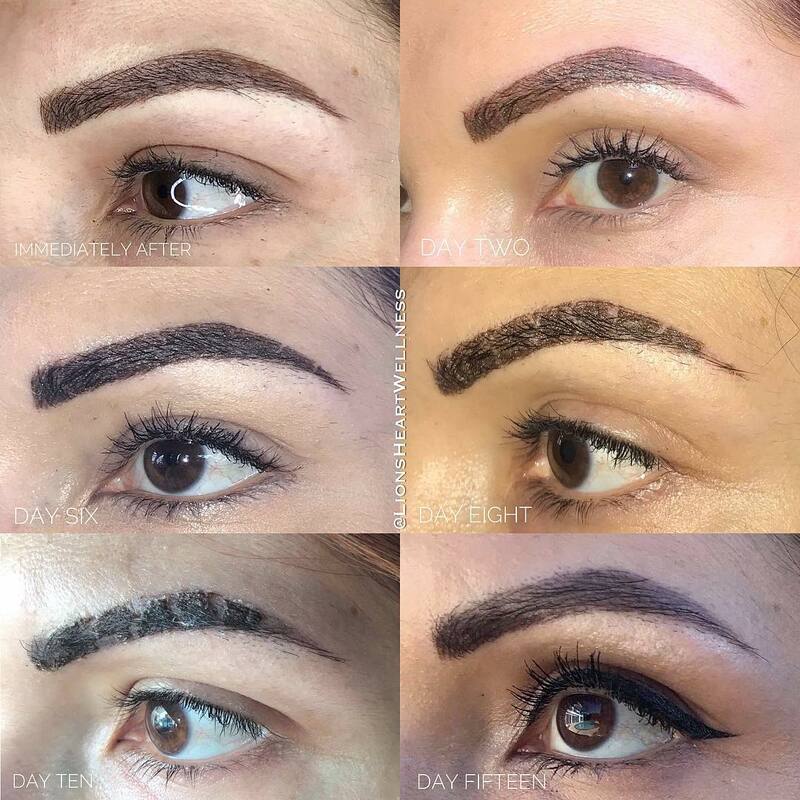 ​Previous tattoos that are very faded and are not grey, blue, or red can often be good candidates for covering with microblading or shading. Tattoos that are darker or undesirable shades may need correction before covering - this involves one procedure to turn the current tattoo from the 'off' color to a more desirable brown hue and then a second procedure to get the brow to the target color and shape. If the brows are still too saturated, a very undesirable shape or the ultimate goal is microblading then saline removal is the best place to start, where we will do a removal session and then a target session once this has healed. This is something we hope will never happen! But there are avenues to explore if it does become the case. Kim takes her time during every new procedure to ensure the design and color is just as you want it and in a way that will compliment your features perfectly. Ensuring you get the results you desire is also another reason a phone consultation is required in order to book a procedure - so that we can assess if you are a good candidate for the procedure and that your expectations for the procedure are aligned with what Kim can do for you. If at some point in time you do want to remove your PMU entirely - laser and saline removal are both options for removal. Some tattoo pigments react undesirably with laser and are not compatible - if you are going to do laser removal make sure to do a test area before the doing the entire area. Kim offers saline tattoo removal at Lion's Heart, this is a good option for PMU removal because there is no risk of discoloration from the laser. The healing process from saline removal can be intense and difficult because there is intense scabbing, that said it's still a great option for removal. Healing & Aftercare are the MOST important parts of this procedure. It's important to know what to expect and how to care for your new brows so they heal in the best way possible. Each artist has their own aftercare directions, it's important to follow the directions your artist gives you to ensure consistency for their practice and your results. Healing time for a new microblading procedure is in two phases. The first Active healing phase is about 2 two weeks, the latent healing phase is an additional 2 weeks. Active Healing - During the first 2 weeks after your procedure your new tattoo will scab and then flake off. Kim utilizes a Dry Healing method where you will need to keep your brows DRY for the first 10 days after your procedure - this means no washing, no lotions, no oils, no ointments, no makeup, no swimming, saunas or heavy workouts. The dry healing method ensures consistency among clients and prevents the tattoo from becoming water logged and losing pigment in the healing process. It may seem tough to not wash your brows for 10 days, but everyone does it, and the healed results are generally very good! Once the scabbing has peeled the underlying tattoo can often seem very light in color from what is expected, this is partially due to the contrast from the scab, and part due to the latent healing phase that has not been completed. Latent Healing - Once the tattoo scab has peeled there is still a healing process going on under the skin. Over the next 2 weeks the pigment in the skin is settling in to it's new permanent location and the skin which was damaged during the procedure is still regenerating and healing. Skin takes a full 30 days to regenerate, and this is what we're waiting for in these 2 weeks. The regeneration of the skin during this phase will slowly make the tattoo appear darker in color, which is expected and desired. We use a Dry Healing method for all aftercare. It's quite simple but tends to go against what our intrinsic nature wants us to do. For the 10 Days following the procedure you will keep your brows DRY. Washing, swimming, sauna, hot tub, lotions, oils, ointments, makeup, heavy exercise. To shower - wash your face before getting in in the sink so you can be very controlled about where the water gets. Shower always facing away from the water. Healing progression of a combo brow. Keeping your brows dry for 10 days may seem like a challenge, but it's usually the easiest part of the healing process. What tends to be the most difficult for clients is the mental adjustment and the consistent changing the brows go through over the first 4 weeks. When we tattoo the brows and finish, we usually expect them to heal very close to how they look when you leave the office, it's important to keep this in mind going in to the healing phase. Scabbing - When you wake up the morning after your procedure your brows may look up to 10 shades darker than when you had them done. This is the scab that's formed - when dark red blood mixes with pigment it darkens it. The scab also is a bit thicker than the actual strokes, so this also leads to them looking a bit larger. Shape Shifting - This is often very mild if noticed at all, but the first 3 days you may notice some slight changes / shifting in the shape. This is due to mild swelling that occurs from the procedure and is dispersing in those first few days. Peeling - Day 4-7 is usually when the brows start to peel. You may experience some itching in the area while this happens. Peeling can be mild to more intense depending on your skin and natural hair growth. The brows generally look their most awkward in this phase because the contrast of the scab to healed skin is stark. Day 10 - 30 - During the latent healing phase, after the brows have peeled you will likely notice a mild shift in color of the tattoo. Initially they may look a bit light, then they will darken slightly as the skin heals more. Timing of your appointment is critical! It's VERY important to factor in the above healing timeline to ensure the best results for when you want them! Best Option: Schedule your first appointment at least 10 Weeks before your event, you'll have time to heal and get your touch up completed and healed just in time. Second Best: Schedule your first appointment at least 4 weeks before, you will be able to have FULLY healed from the first procedure and will need to do your touch up upon your return or after your event. Last Chance: Schedule your appointment at least 2 weeks before, this is cutting it close but most people are fully finished with the active healing phase 10-14 days after the initial procedure.